Incredible Wi-Fi Function –Support online Streaming Music. Get rid of the Bluetooth only 30ft range. Provide personalized preset which could be your favorite radio station like Pandora, Spotify, or iHeart, or your favorite music from playlists, albums or your music library, it will set your Smartphone free once set. Also support Bluetooth and Aux-in for your more options. You will enjoy your music world at any time. Be different from traditional Bluetooth speaker, the newest Wi-Fi technology can guarantee bandwidth up to 300Mbps. The higher bandwidth carries more audio signal. It means that you can stream music without sound loss, giving you full, rich music quality. Complete with 2*5W Drivers with 2 Subwoofers output power, filling your room with powerful sound. Provide three modes: Wi-Fi, Bluetooth 4.0 and Aux-in for your more options, all functions are in one device. All the modes can be switched in any time (Via “M” button). Considering the compatibility, we also built Bluetooth and Aux-in function for you besides Wi-Fi. If your friends&apos; Smartphone or other sources are not currently available to the Wi-Fi, they can also stream music via other connection way. MUZO Player APP is actually a senior interface of the Wi-Fi Speaker: Through the APP, you can customize audio to adapt to a particular application environment. Users can choose their favorite radio or music source through the speaker equipment buttons or under APP control play. Support online Streaming Music. Provide personalized preset which could be your favorite radio station like Spotify, or your favorite music from playlists, albums or your music library. After preset, it will bring you more convenience to enjoy your favorite music only by the included buttons, you don&apos;t need to get your Smartphone to do. All the above is controlled with a Single App which is easy to setup. Each Wi-Fi Speaker is part of a whole family of wireless speakers and also systems. If you buy two or more Wi-Fi Speakers, you can use one phone to connect them to play different music in different room, or play the same in every room. And, the Wi-Fi Speaker itself supports independent work, doesn’t need to take up the audio channel of phone. 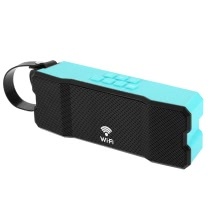 Product Type: Wireless WIFI / Bluetooth 4.0 Speaker. Waterproofing Grade: IPX6 (YF-801 Bluetooth Speaker adopts IPX6 Ingress Protection Design, which features a water-resistant case that protects its components from splashing water, ensuring happy playing without worry any more. Just enjoy yourself in the shower, at the pool, on a hike or anywhere). Built-in 4500mAh battery provides up to 6 hours’ music playing time. After bought a Wi-Fi speaker, usually, several people listen to music in the room together. Everyone wants to listen to their own songs and will recommend their favorite songs to each other. If use Bluetooth speaker, the system can only supports connecting to up to two audio devices. When the speaker plays the current song, if other people want to play the songs they like, the only way is that disconnect the Bluetooth connection and connect with another Smartphone. However, if it is a Wi-Fi Speaker, and every listener’s Smartphone has the APP, they can connect to the speaker at the same time. For example, for the next song, I want to listen to an appointed song, just need to select the song in the APP, then add it to the play list(directly switch is allowed), every person can see this song via APP. One-to-many is the advantage of Wi-Fi speaker, Wi-Fi technology is inherently support multiple device to connect, solving the problem of multiple speaker control. Meantime, Wi-Fi speaker itself is a computer system, the Smartphone, Tablet PC or Laptop is just the remote controller, the added play list just give a link of the online music to Wi-Fi Speaker, mobile phones are not directly involved in it, so doesn’t has the problem of the order of connection. It is determined by phone itself, but if you use WI-FI Speaker, the Wi-Fi Speaker itself supports independent work, doesn’t need to take up the audio channel of phone. At the moment, using phone to play the video will not be affected, don&apos;t need to suspend the music, also won&apos;t release the voice to the speaker, these two sound are independent, if you want, the background music can go around you all the time. These are the features of Wi-Fi speaker, speaker works independently, not take up the audio channel of phone, naturally won&apos;t turn up the voice of the phone system. 1)Long press the power button for 3 seconds (to turn on the Speaker), and the green light on the top of the Wi-Fi Speaker will be light and flash (Note: It is starting the that time at that time, can not connect to WIFI). You will hear the voice prompt “Starting Up” after 20 Seconds. It means that the start-up of the system was completed, and then you can search and connect Wi-Fi Speaker. 3)After connected successfully, you can play the “local music” in “my music” of MUZO player, or other players in your phone. Because of the differences between various players, the default players is phone player, and you need to manually switch to WIFI Speaker playback. 4)The same speaker allows to connect with multiple Smart phones.